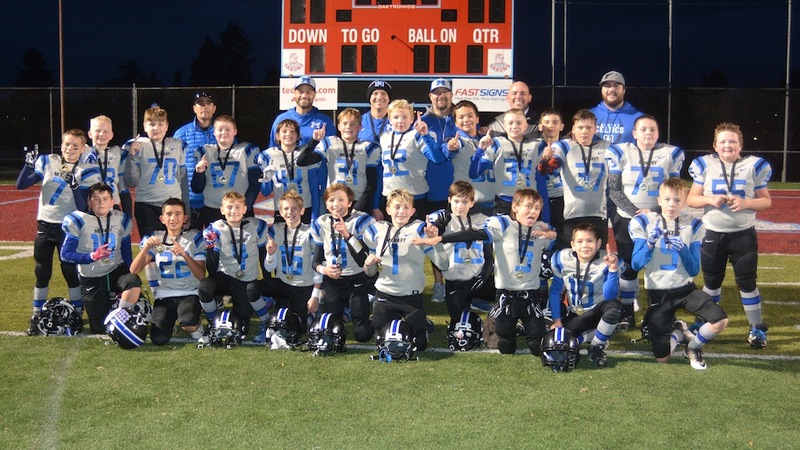 SALEM—McNary’s fifth and sixth grade blue team came from behind to defeat Lakeridge 9-8 on Saturday, Nov. 11 in a Tualatin Valley Youth Football League gold bracket championship game. Playing at South Salem High School, McNary trailed 8-0 at halftime but a deep pass to Christopher Cortez got the young Celtics deep into Lakeridge territory. Jesse Dyer then cashed in with a 6-yard touchdown run but the extra point was blocked with 3:45 remaining in the third quarter. After McNary’s defense got a stop, two more catches by Cortez, including one from Dyer on a fleaflicker, got the Celtics back inside the Lakeridge 10-yard line. But the drive stalled at the 9 and on fourth-and-8, Dyer kicked a 26-yard field goal to put McNary on top 9-8 with 5:46 remaining. Dyer then showed off his all-around kicker skills, delivering an on-side kick, recovered by Pierce Walker. After a Celtics punt, Lakeridge took over at its own 39-yard line with 3:27 left to play. The Pacers drove the ball to the McNary 12-yard line with 1:20 remaining. With Lakeridge coaches debating how close they needed to be to attempt their own field goal, Davis Olsen sacked the quarterback for a five-yard loss. After losing four more yards to force a fourth-and-long at the 21, Keenan Chase intercepted a pass with 16 seconds remaining to seal the Celtic victory. McNary finished 7-1 in the nine-team Percich-Valley division, outscoring their opponents 257-82. As the No. 1 seed, the Celtics shut out West Linn, the No. 2 seed in the Harrison-Pacific, 19-0 on Saturday Nov. 4 in the first round of the playoffs. Lakeridge, who entered the championship game undefeated, was the No. 1 seed out of the Harrison-Pacific.